When I was teaching back in Indiana, I used PowerPoint fairly regularly to present content to my students. It served as a record of what I had taught, so I could use it the next year; it allowed students who were absent to catch up on some of the material that they had missed; it helped students know what they were supposed to take notes on in class. Since I’ve been in Hanoi, I’ve been able to take a step back and reflect a bit on all those PowerPoints, somewhat to my chagrin. As I sit in the theater with the other teachers and we watch a presentation from Operations, or Finance, or the Board of Directors, I remember what it’s like to see people reading off of PowerPoint slides. Although there are many different metaphors that I find helpful when I think about teaching, one of them is performance art. It is a type of performance that should be more interactive than a movie or a theater performance, but perhaps less than a massive game of soccer. If teaching is a performance, then what is the metaphorical equivalent of reading text off of PowerPoint slides? Would that be akin to watching actors play out a scene before they are off-script? 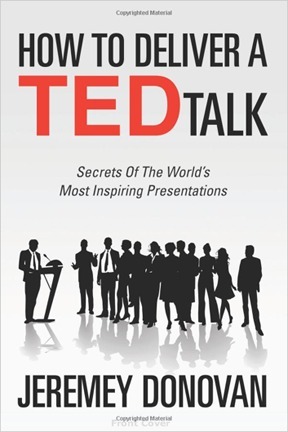 Last November I read How to Deliver a TED Talk: Secrets of the World’s Most Inspiring Presentations, by Jeremy Donovan. Donovan has spent years studying what makes for an effective presentation, and is also one of the most avidly anti-PowerPoint presentation writers I’ve seen. In his mind, the majority of slides in presentations do the opposite of what was intended: rather than enhancing the presentation they distract from it. Donovan points out that the most popular TED talk as of yet, Sir Ken Robinson’s “Do Schools Kill Creativity”, does not use any slides or images at all. Robinson is not the only one who has found power in stripping his presentation down to the bare essentials; another great example is Angela Lee Duckworth’s “The Key to Success: Grit”. And yet, neither life nor teaching is a TED talk. Crafting a strong, clear message can not take a cookie-cutter approach, and different presentations require different elements. With that said, here are some thoughts about a few different presentation styles and what strengths each bring to the table. Love this table of different presentations styles – what a great resource! I wonder if there’s a way to make it visual rather than text based?